Products: Gold jewellery, diamond jewellery, gemstones, silver articles, silver jewellery and a range of silver and gold corporate gifts. Address: Jetalpur Road, Near Bird Circle, Opposite Anjoy Restaurant, Alkapuri, Vadodara 390 007. Working Hours: 10.30 a.m. to 8 p.m., 7 days a week. Established in 1927, we are one of the oldest and most reputed jewellers in Vadodara. Our first shop was founded by the Late Shri Lakshman Rao Mahadev Gandevikar at Dandia Bazar. He was the personal goldsmith of the Royal Family of Baroda. The responsibility of the business was subsequently taken over by his elder son Shri Purshottam Lakshmanrao Gandevikar and younger sons Shri Sunil Gandevikar and Shri Girish Gandevikar. 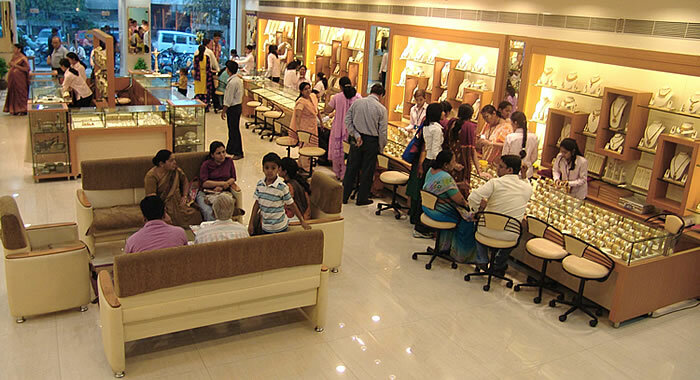 We have progressed from a small jewellery shop to a large showroom Gandevikar Jewellers Pvt. Ltd. that is located on Jetalpur Road, Near Bird Circle, Opposite Anjoy Restaurant, Alkapuri. We have carried forward our trust, transparency and perfection with customers from three generations of their families. With changing times and technology we try to give our customers a variety of jewellery and the full choice of satisfaction with best quality products.